Long time South Philly bar staple Triangle Tavern recently had new life breathed into it earlier this year after having been closed for over half a decade. Located at the triangular intersection of East Passyunk, Reed & 10th streets, the Triangle has been given an upgrade by the Royal Tavern/Khyber Pass Pub/Cantina team. And keeping with the South Philly flair, they’re serving up spiked water ice (a godsend given that the Rita’s across the street shuttered last year) and Italian classics like spaghetti & meatballs and eggplant parm. There’s also a burger on the menu, topped with bacon, provolone & a long hot. 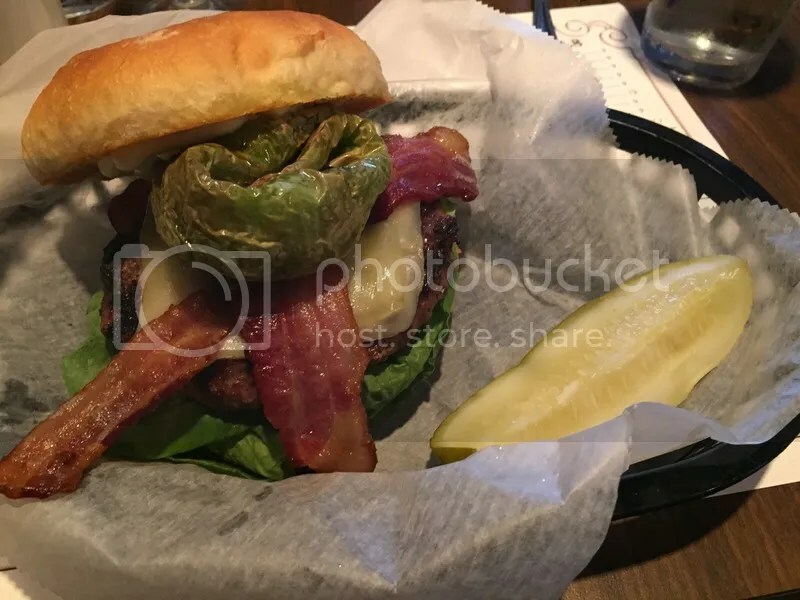 Normally, I’d be remiss to order a burger at a restaurant that caters to a particular ethnic cuisine, but I love the burgers at Royal Tavern & Khyber, so I took my chances. My burger came out & the first thing I noticed was the lack of fries. I guess at $12, I had wrongly assumed that I would get something on the side other than a giant pickle & pepper? But what the burger lacked in accompaniments, it made up for in size. The patty was massive! At least 10 ounces, cooked perfectly to medium & had an amazing char on the outside. The housemade bun was soft and proportional to the patty and made great work of holding back all the juicy runoff from the meat (having a “lettuce diaper” underneath helped as well). The bacon was nice and crispy and the cheese, gooey with a little bit of sharpness. I didn’t eat the long hot because of my wimpy palette, but I could certainly smell how hot it was! In the end, I was thankful that the burger hadn’t come with fries because the patty was so big, I could barely finish it all! I’ve had burgers that I’ve failed to finish because they were terrible or I ran out of bun, but this guy was just too much meat for me to handle. 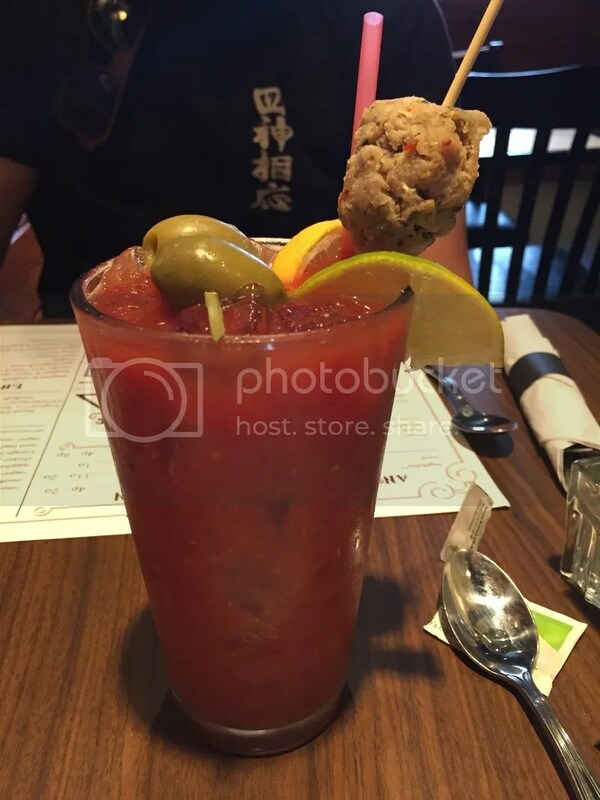 If you’re heading to the Triangle for brunch, I strongly suggest ordering a Bloody Mary – it comes with a meatball garnish! And dat’s a spicy meatball! Posted in bacon, buns, burger, burgers, East Passyunk, East Passyunk Ave, EPX, Italian, meatballs, South Philly, spiked, that's a spicy meatball!, Triangle Tavern, water ice, wooder ice. Bookmark the permalink.